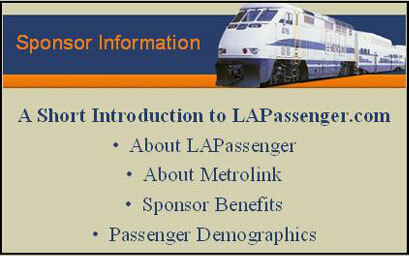 LAPassenger is the largest community of Metrolink passengers online and a highly popular service that is growing rapidly. LAPassenger.com has over 2,000 page views monthly, and growing. Market your business or services to the professional, eco-conscious, technology savvy members of LAPassenger.com. 15 min. behind out of Moorpark. "Solar for your home or business."